Even as a casual fan of the momentous band Queen which rocked the ’70’s and ’80’s, I can tell when the music biopic Bohemian Rhapsody is filtered or watered-down, or just plain lying to me. Rami Malek is at times electric as Freddie Mercury, but it’s clear that the movie wants to oversay something about his bi-sexual ways but not just say it clearly. Giving us hints, insinuations, and allusions about his behavior – but the movie itself never being totally honest with us. 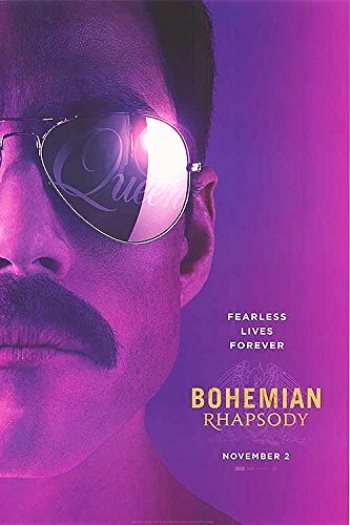 Freddie’s first music tour in America is a smash success and then goes on other successful world tours told in montage, only to return home be pried by his wife Mary (Lucy Boynton) to be honest about himself. His answer, he is bi-sexual. But we have no idea at that point how many times Freddie has been with men, if he’s a serial sexaholic or if he’s just dabbled with the other side. The movie also doesn’t care to want to explain how deep his drug use was, or more importantly, when the recklessness began. Oh, how I wish the movie would just rock me. I know all the great songs by Queen, and it’s always great to hear them again (even if I’m just getting it in fragments). But all these songs I’ve heard numerous times. There’s not a song in the movie where I went, Wow, I’ve barely ever heard that one and now I got a re-evaluate how special that song is. The way the songs are laced throughout the movie is given a by the numbers approach. A song is used to underscore the drama parsimoniously in Freddie’s life somehow. The movie has no ebb and flow. There could be a drama about how Freddie was courted by CBS Records to abandon his band and go record on his own, and it takes nearly twenty-five cumbersome minutes to play out. A good biopic would have condensed it to about eight minutes. There’s some good concert scene cutting, but overall, this is one of the worst edited movies of the year. The writers of the movie, Peter Morgan (“Rush”) and Anthony McCarten (“Darkest Hour”), want to cover Freddie’s young adult life and hit every signpost to his end – the result is a sketchbook, and one that is increasingly too mopey or cheerless. Malek is a genuine article, but it doesn’t help that everybody else in the movie is acting at a VH1 Behind the Music level of artificiality. As it would have it, the movie is creakingly down in the dumps in the last third with Freddie lost in his own private hell until the people that love him get him back up. 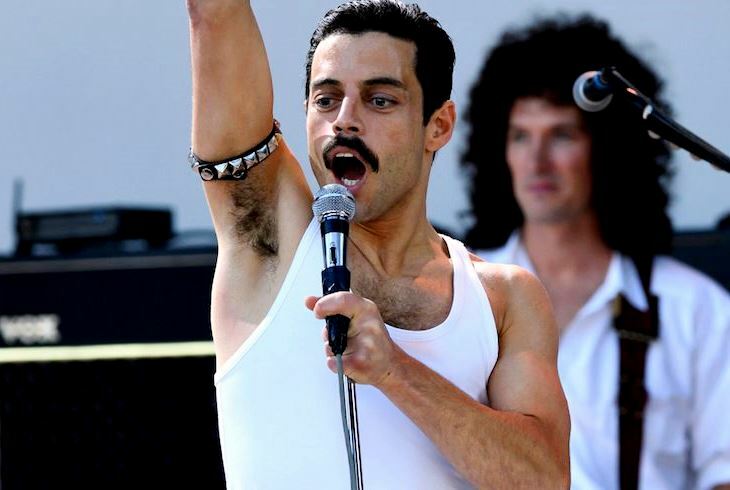 It’s the movie though that needs resuscitation, and when Freddie Mercury (and Queen) perform at the Live Aid in 1985, a non-profit concert to save starving children in Africa, the ecstatic joy of the music and exuberance of Freddie’s stage performance dramatized gives the movie a much needed jolt of life. The movie has been a wash for the most part, but at least it ends on a blast. Bryan Singer (“Valkyrie”) is the credited director, but Dexter Fletcher (now working on “Rocketman,” an Elton John biopic) did some reshoots, too. Film Cousins: “The Doors” (1991); “Wayne’s World” (1992); “Velvet Goldmine” (1998); “Get On Up” (2013).